I forgot who it was. Friend of my wife, I think. My wife came home from work one day, the long slog up the highway and back over, a few shekels in her pocket, a slight aureole of weariness glowing around her, and handed me one of those nasty plastic pouches that have replaced paper bags at the supermarket. 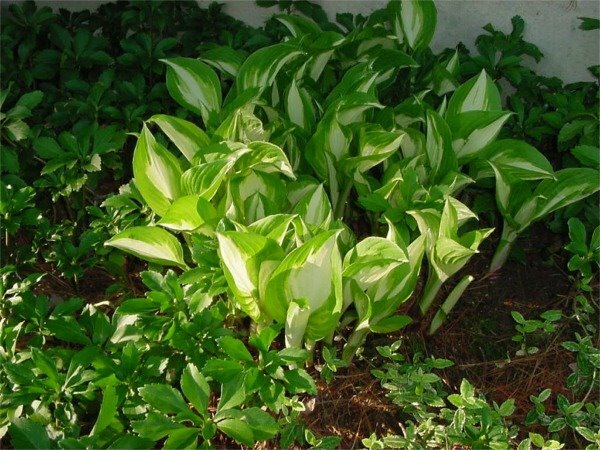 In it was an awful, dirty, watery fistful of hosta, given to her by one of her coworkers. It looked exactly like some half masticated frond a stegosaur might have spit out over some perceived unwholesomeness. It was too muddy to throw away, so I planted it. I planted it with all the hope for resurrection I had when I planted the poor cat out by the swamp when she had strayed too close to the road and broken our hearts. That is to say: none. The hosta was nothing to me, but where else would I put it, but in the ground? I like that. An unentitlement. According to this web site, it is a tune of hummingbirds. But I would not like to relate to you the ridiculous amount of time I spent searching for this. This is apparently the only man on the face of the Earth in possession of this fact. So, I say unentitlement wins. Jennifer, you deserve an award, or at least two aspirin, for reading that linked page of white text on a blue marble background. Remember, though, when faced with a conflict between the facts and a legend -- print the legend.